We’d love your help. 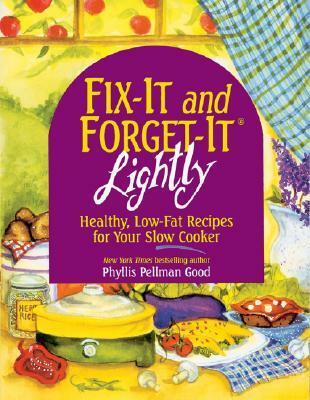 Let us know what’s wrong with this preview of Fix-It and Forget-It Lightly by Phyllis Pellman Good. 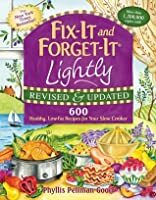 To ask other readers questions about Fix-It and Forget-It Lightly, please sign up. I was treated to this book by my family. I’m always moaning about what to cook in the slow cooker. This book has loads of recipes and lots submitted by every day people like myself, so it made interesting reading. There are soups, main meals and desserts with things in between. Lots of cheese recipes though, but, a good low fat cheese or use less of an extra mature cheese, you won’t need so much. It’s easy to adapt each recipe for your families tastes. One of the best compilations of the best slow cooker recipes I have found yet. I love to set it and forget it on a cold winter morning as I leave to work. The problem is I never forget it! I tend to think about what I have cooking all day at work and how good my place smells. This is a good one because it offers low cal options to what is usually a cheese and cream dominated field. Yup, my mom got it for me and signed the front cover. I used a chicken recipe from this book for my first date with my boyfriend, whom I've been dating for three years. The only problem with this book is that many of the recipes are either really good or really crumby. I would strongly suggest using the beef stroganoff to anyone, but never the orange chicken. The other thing is that the recipes don't always give a proper amount of liquid, so some meats can wind up tasting like sawdust. Hmm, I didn't realize how large a role fat-free cheese would play here. Fat-free cheese is yucky. Plus, I think it might be illegal in Wisconsin. Luckily, I did find some cheese free recipes to try! A lot of the recipes are repeats. Healthy and tasty recipes abound! Using the crock pot is a great stress relief during the holiday season. I wasn't such a fan of this, although it did have its good points too. For the good: there is a wide variety of food, including main dishes, soups, and desserts, even vegetarian. There is a variety of cooking times so you can always find something for however long you work that day. The nutrition info is clearly labelled after the recipe, including fiber which is usually omitted, and they all are very low calorie and fat, but slow cookers bring out the flavors, so they should still be good tasti I wasn't such a fan of this, although it did have its good points too. For the good: there is a wide variety of food, including main dishes, soups, and desserts, even vegetarian. There is a variety of cooking times so you can always find something for however long you work that day. The nutrition info is clearly labelled after the recipe, including fiber which is usually omitted, and they all are very low calorie and fat, but slow cookers bring out the flavors, so they should still be good tasting. For the bad: this is a cookbook where people submit their own recipes, which I find to be hit or miss to begin with, but additionally there is a lot of overlap-you can sometimes find 4 or 5 different recipes for the same dish, which to me seems like a waste of space. Also, I don't consider myself to be an overly picky eater, but it seemed like almost every recipe either had pork, or mushrooms, or bell peppers, or celery-blegh. Plus there are no pictures at all, and I am highly visual when it comes to choosing a recipe to try from a cookbook. I really am very happy with this book and have done about 15 different recipes. My household likes things very flavorful so as a rule I pretty much double all the spices required for any recipe. I find that most of the recipes in the book are a bit bland but I find most of my friends cook that way so understandable. My favorite thing about this book is the nutritional information for each recipe, most books do not give you vitamin information and this one includes it. Recipes include main courses I really am very happy with this book and have done about 15 different recipes. My household likes things very flavorful so as a rule I pretty much double all the spices required for any recipe. I find that most of the recipes in the book are a bit bland but I find most of my friends cook that way so understandable. Recipes include main courses, soups, vegetables, desserts and extras. Meats as well as vegetarian recipes and low-sodium ingredients are a priority. As others noted: There are several recipes that do seem to differ by only one or two ingredients but I have found that what affects most in cooking is the fresh spices you use, not so much the ingredients. Think Mexican cooking, few variety in actual ingredients...is the spices that matter. If I could only own one, I would buy this one over the original, "Fix-it-and-Forget-About-It". 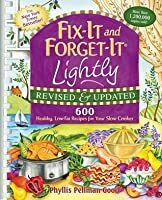 My one critique of the original book was that many of the recipes lack any concern for nutritional content -- this edition addresses that problem nicely. Cutting out fat is the starting point, but I did notice some recipes that still rely on high carb/ sugar, or sodium for flavor, but these faults are more easily repaired. This is an excellent resource for crock pot cooking. Being If I could only own one, I would buy this one over the original, "Fix-it-and-Forget-About-It". This is an excellent resource for crock pot cooking. Being able to assemble dinner in the morning and know it is cooking away and you don't have to worry about it for the day is a WONDERFUL feeling. It is also a nice way to cook in the summer as the crock pot throws off less heat than my oven. I have been very happy with the recipes I've made, as well as the breadth of this book (soups, main meals, meat, ect.). This book is full of healthy recipes. 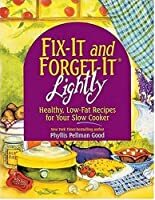 There is also and index and an About the Author section.The book has over 500 recipe, and each recipe has a suggested slow cooker size and gives the serving size. My favorite thing though is that they all have the nutritional value. That’s priceless for someone who had dietary limits or is tryin This book is full of healthy recipes. I've only tried a few recipes in this book...mainly because it takes a darn long time to make a meal in a crock pot (I like to stuff my face as soon as humanly possible). The soup recipes are great--ham and cheese soup (with a lil extra cheese!) is delish! The rest of the book is promising. Lots of nice recipes for desserts, even some beverages. Naturally, these recipes are lower in fat and sodium, so you may find you have to add in some other ingredients (or more of the ones listed) to get the f I've only tried a few recipes in this book...mainly because it takes a darn long time to make a meal in a crock pot (I like to stuff my face as soon as humanly possible). The soup recipes are great--ham and cheese soup (with a lil extra cheese!) is delish! For years I've been making slow cooker recipes and for years I've been disapointed. The meals always smell so good but I find them too bland and too mushy and too, strangely, dry. I keep trying but I don't think I will find what I'm looking for here. 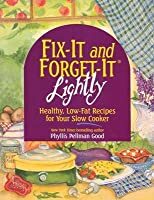 This is a friendly and simple book, a collection of recipes from cooks all over, but they all seem rather mundane - just the same old crock pot fare. Love this "cook"book! I do try to be careful about the sodium though, by buying low sodium soups/broths for the various recipes and we don't miss the salt at all. My husband loves to use this cookbook - it's so easy to just throw a few things in the crockpot and have dinner ready a few hours later, especially during the cooler months when the days are shorter! These recipes all make for very cozy meals (& leftovers!). I use this book a lot since I like the idea of dumping ingredients into a pot and letting them cook while I go and do something else. I have the regular version too but it has gone off to university with my dd. Just made the Greek chicken minus the salt and it was very tasty. Lots of variations on different recipes depending on what you have on hand and what your family likes. Slow cooking is also a great way to use cheaper cuts of meat and have them come out tender. I am going to be doing "Once a month" cooking soon and found quite a few recipes in here I could prepare ahead and throw in the freezer. There were quite a few I think I can prepare raw/uncooked, throw in the freezer and then just dump in the crock pot when I want to. I love that there are the nutrition facts on each recipe as well since I also am following Weight Watchers and that makes it easy for me to calculate my points usage. Of all the crock pot recipe books I've checked out of the library, this is the only one I am going to hunt down and buy. The bean and veggie chapters had more, and more useful, recipes than whole vegan books. The format is clearly laid out and the size of the pot is always specified, so I can easily halve recipes to fit my small pot or decide to haul out the bigger one for parties. This is my favorite way to cook with small kiddos around, so I was thrilled to find healthier slow cooker recipes. My favorite recipes so far are the Chicken Tortilla Soup and the Corn Chowder. The best part is the nutrition facts posted at the bottom of the recipe. Another really good book in the Fix It and Forget It series. Lots of straightforward recipes, and includes a calorie count of each recipe. Comprehensive index end this excellent cookbook. Another one that is going to be worn to rags because it will get used over and over again. The amount of processed food "ingredients" disappointed me. The quantity of recipes devices me too. There appears to vee hundreds, however they all seem so similar. there might be 30 with each repeated with a minor tweak to make it a "new"recipe. Not a book for "clean" and adventurous kitchens. Read after recommended by a friend. I've read other books in the series, but was pleased to see one that provided nutrition information. A number of the recipes are very similar, but I certainly acquired some new recipes to try. Lots of wonderful recipes, the reason it didn't get a fifth star was because there are no pictures. Can't say enough good things about this series of books. Very dependable. My only issue with this book is how few vegetable dishes were in this. A very bare bones cookbook with a bunch of uninspired, insipid looking excuses for recipes. I'll admit it, I love my crock pot. This book has a good collection of recipes (that are light-ish) and includes full nutritional information. I enjoyed looking through this cookbook a lot, since I love my slow cooker! I saved several of these recipes in Evernote for later cooking. Fairly simple recipes, and quite tasty, or at least the ones I've tried so far! Best Beef stroganof that is lowfat ever!!!!!!!! !